What we are going to do is first to convert the IP address into binary then convert it to decimal again which we will use to browse the pages and which will not be blocked/even not identified by firewalls. 1) Find the IP address of any website as I mentioned before by use of Ping command in command prompt. goto start>run>type "cmd">type "ping www.example.com"
without quotes and copy the IP in notepad. Here I am going to use 68.71.209.223 for now. Select the radio button decimal now type 74 and now click on bin radio button to convert to the binary that is 1000100, copy the binary code in notepad. Repeat the process for 125, 155 and 99 resp. 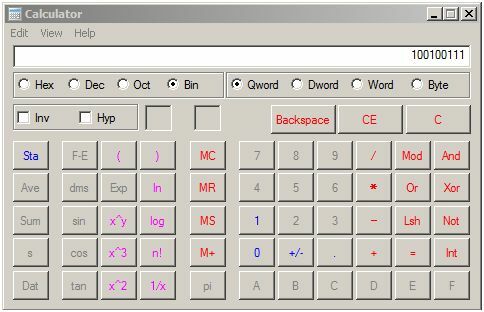 Some of the binary values are not of 8 bits(8 digits). So place 0 before the code to make it of 8 bits. now convert it into a decimal by selecting the Dec radio button. I hope you enjoyed this technique! You can also use hexadecimal and octal IP addresses. Some dotless IP addresses are also available. You can share your experience and queries here. Thanks for dropping by my blog! I'll be in touch! Everyone is equal before technology! This blog is for all. I hope you find something of your interest here. It's not Proxy here if you read carefully.